Tired of waiting until the last minute to get your kids’ stocking stuffers? This year, prepare early and get your child something sure to make them smile, like an Arm & Hammer Spinbrush Kids toothbrush. With a variety of colors and characters, like Spaceman, Mermaid, Butterfly or Skateboard, there is something for everyone! We were sent the Soccer & Astronaut Spinbrush for my boys to try! I have to say it was nice to open a package and the product worked, YES the batteries are included! I was also impressed with the design and how cute they were. The real test was would my boys like using them. Well the answer is yes!!! I was worried the my toddler would not like it but to my surprise he took to it like a pro (see pic below). He thought it was fun, he is always asking to brush his teeth, instead of me begging !!! My 10 yr old thought (in his words) that his new toothbrush was "cool". Great handle designs make brushing fun! 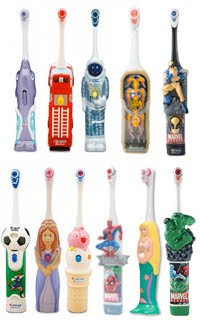 Less than $7 U.S. suggested retail price** – only a few dollars more than an ordinary manual toothbrush! Great as a stocking stuffer at $6.29 or less. Let Spinbrush take the guesswork out of gift giving. With a few things in mind and a fun-handled Spinbrush, you’ll actually have your children looking forward to brushing. Schedule regular dental visits for checkups, periodontal evaluations and cleaning. But do it so the entire family goes together. Check your child’s mouth for the signs of disease, including bleeding gums, swollen and bright red gums, gums that are receding away from the teeth and bad breath. And finally, if you notice that your child has poor oral-health habits, work to help change those tendencies now. After all, it’s much easier to modify faulty habits in a child than in an adult. A healthy smile, good breath, and strong teeth all contribute to a young person’s sense of personal appearance, as well as confidence and self-esteem. Oh! I'm sure any kid would love this! I'm amazed how big they are! Not puny toothbrushes.